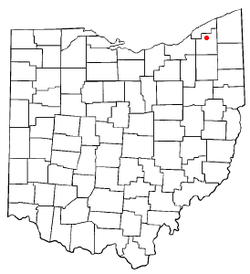 "Home Of The Geauga County Maple Festival"
Chardon is a city in the U.S. state of Ohio and the county seat of Geauga County, Ohio, United States. The population was 5,148 at the 2010 census. ↑ 2.0 2.1 "US Board on Geographic Names". United States Geological Survey. 2007-10-25. Retrieved 2008-01-31. ↑ "Population Estimates". United States Census Bureau. Archived from the original on 2013-06-17. Retrieved 2013-06-17. ↑ "Chardon: United States, name, administrative division, geographic coordinates and map". Geographical Names. Retrieved 2014-09-12. ↑ City of Chardon - History. This page was last changed on 30 July 2018, at 17:07.